A live production from NPR and WBUR Boston, in collaboration with public radio stations across the country, Here & Now reflects the fluid world of news as it’s happening, with timely, smart and in-depth news and conversation. Here & Now has a successful track record: it began at WBUR in 1997 and is carried today by over 180 stations nationwide. 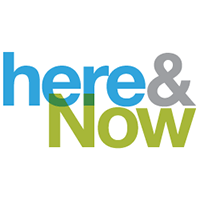 Here & Now will expand from one to two hours on July 1 in collaboration with NPR. The expanded program will serve as a bridge in midday, between NPR’s signature news magazines, Morning Edition and All Things Considered. This marks the first time NPR has collaborated with a member station on a daily news program. Hundreds of stations nationwide will be carrying the expanded Here & Now, presenting listeners the opportunity to hear more NPR news from around the world and across the country every weekday. The program’s daily lineup will include interviews with NPR hosts, reporters, editors and bloggers as well as news from stations across the nation. With its midday timeslot, Here & Now will often function as public radio’s first source for breaking news coverage with NPR. Here & Now has been hosted by Robin Young for more than a decade. A Peabody Award-winning journalist, she has reported for NBC, CBS and ABC television, and was substitute host and correspondent for The Today Show. Starting July 1, Young will be joined by co-host Jeremy Hobson, most recently host of Marketplace Morning Report. Hobson has broad producing, reporting and hosting experience at the station, program and network level. Additionally, Meghna Chakrabarti, co-host of WBUR’s Radio Boston, has been named as the program’s primary back-up host. To ensure that Here & Now reflects what’s happening in a diverse geographic range of communities, NPR and WBUR have invited other public radio stations across the nation to contribute to the show. These contributions may be presented as feature packages, interviews or straightforward collaboration when news is unfolding in a specific market.